The Providence Bruins put a four-game losing streak to rest early on over the weekend, downing the Wilkes-Barre/Scranton Penguins 1-0. Zane McIntyre earned the shutout in a sign of things to come. McIntyre earned his second shutout of the weekend just two days later against the Springfield Thunderbirds in a 2-0 win. It’s a long time coming for McIntyre, who’s had a down year. The P-Bruins also welcomed back Boston prospect Jeremy Lauzon after missing 22 games due to a concussion. Anders Bjork’s stay in Providence is over for now, at least while Brad Marchand is suspended. Lauzon has missed a good chunk of his rookie season in the Bruins system, only appearing in 18 games. The 6-foot-2 defenseman out of Val-d’Or, Quebec was Boston’s second-round pick in 2015. Despite only two assists, Lauzon was a plus-8 before going down with a concussion after 15 games. That’s not a bad performance for a rookie in a small number of games. Keeping Lauzon on the ice will not only help the P-Bruins, but management in Boston may breathe a sigh of relief. Lauzon missed parts of two seasons in juniors with injury, but still put together an impressive resume. 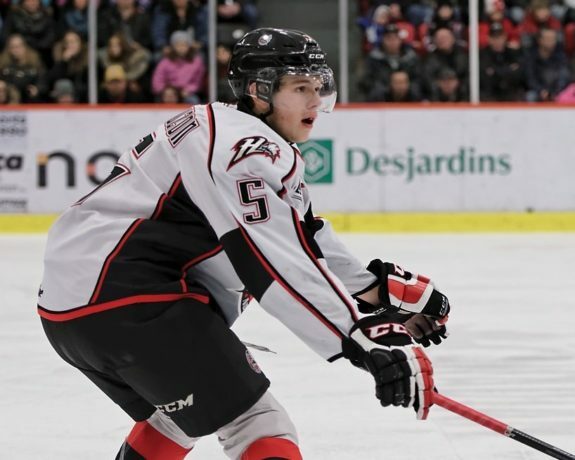 Lauzon did it all in his junior career, playing four seasons for the Rouyn-Noranda Huskies of the QMJHL. He appeared in the 2016 Memorial Cup for the Huskies after the team won the QMJHL championship. Lauzon displayed some serious toughness and determination, appearing in the Memorial Cup after taking a skate to the neck during the playoff run. A season later, he represented Team Canada at the World Juniors. Lauzon won a silver medal as a part of that team, scoring in the goal medal game in a 5-4 shootout loss to the United States. There’s a lot to like about Lauzon’s game, and it will be interesting to see how he bounces back from the concussion. He can play a hard-nosed game and was arguably one of the more feared defenders in juniors. It’s not a matter of toughness, he just hasn’t had the best luck with injuries. He also has some offensive ability to go with it. Now that Lauzon is back on track to continue his development, he has the potential to be a key piece to a Providence playoff run. Zane McIntyre has had a rollercoaster season. His struggles have been well documented, but after the most recent weekend stretch he’s trending up again. McIntyre turned in two shutouts to win AHL Player of the Week honors — the Bruins sixth-rounder stopped 55 of 55 shots over the weekend. McIntyre is currently the next man up for the Bruins if they should need an extra goalie. Although his goaltending partner Jordan Binnington is an AHL all-star, he’s still St. Louis Blues property. McIntyre coincidentally, has picked up his play since the all-star announcement. The organization can hope this may be McIntyre pushing back, and finally responding positively to a goaltending competition. Within the Bruins organization, McIntyre may not be pushed for a while. He hasn’t played well enough to inspire the Boston brass to bump him to the NHL backup job next season. That means down the road he could be splitting time with Daniel Vladar next season. Although just 20, Vladar’s numbers haven’t been over the top this season. 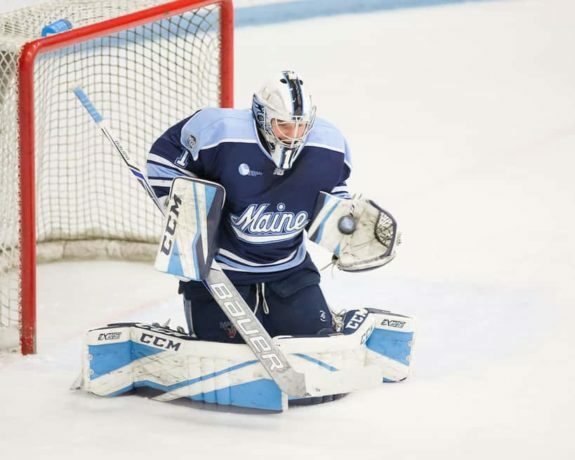 If Bruins fans are looking for a goaltending prospect to keep an eye on, the University of Maine’s Jeremy Swayman has burst onto the college hockey season this year with a 9-5-3 record, 2.56 goals against and a .926 save percentage. The P-Bruins have a couple games over the weekend before Monday’s All-Star game. While it’s not exactly an all-star break, the team still avoids the common AHL three-in-three weekend schedule. They have lacked the consistency they had at the beginning of the year. Even a small break in the schedule may help this talented team get back on track.